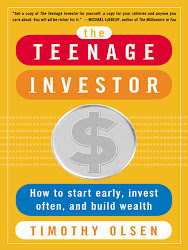 This morning I read an interesting article entitled 5 Ways to Teach Your Kids About Money. Since this blog is for Gen Y investors, it may seem like there are few if any practical applications for us when it comes to financial advice given to children. Looking a little deeper, there are certainly areas where we can learn from the article. The biggest piece of advice from the article that I think is quite beneficial to millennial investors would be #4: Delayed Gratification. Few, if any younger investors (millennials, included) are satisfied with delayed gratification. I tend to think that the Baby Boomers and generations before them are able to delay gratification because they grew up during wars, severe economic recessions and vast periods of inflation that also included a lackluster job market. In short, they were taught to save now and enjoy the fruits of those savings later. When it comes to Gen Y, we tend to want all of the benefits of an activity now. While this may not be unrealistic given how much our economy and business landscape has changed, it doesn't necessarily bode well as the recipe for a successful investment plan. Instead, if we take time to recognize that by saving and investing today, the odds are very good we will have a secure financial future to look forward to our generation will be vastly better off! This is probably an aspect of the whole investing experience you should focus on. In our age of instant communication and instant transactions, our generation might not be equipped to enjoy a slow, steady rise.